Topic: Boogie Mark 2B Coliseum = animal!!!!! Re: Boogie Mark 2B Coliseum = animal!!!!! There's a form for Mesa str 415 tubes at a discount if you buy them by the dozen! Boogie Mark 2B Coliseum = animal!!!!! Topic: Under chassis 1/4” inputs? Re: Under chassis 1/4” inputs? Can anyone help me identify these inputs? Topic: Will a Mark IV fit in a JP2C headshell? 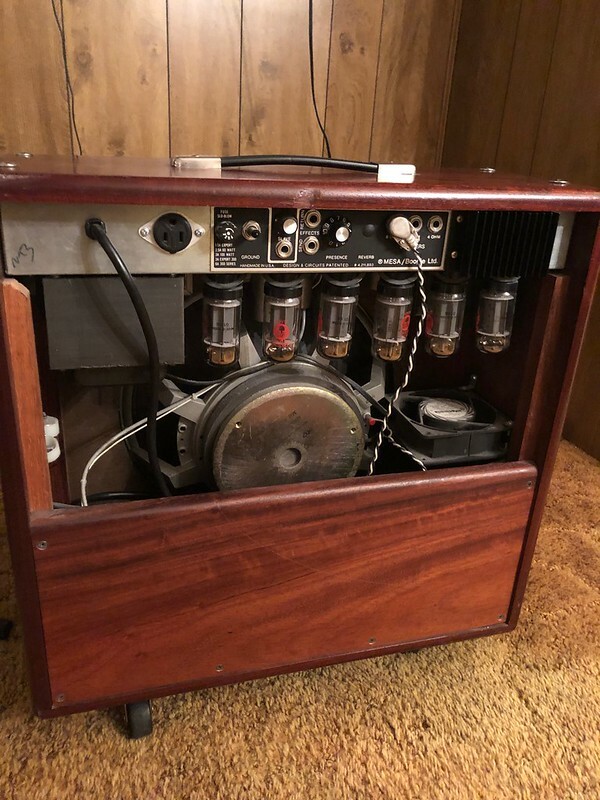 Re: Will a Mark IV fit in a JP2C headshell? Topic: Missing/Lost/Stolen 79' Mark IIA 15"
Re: Missing/Lost/Stolen 79' Mark IIA 15"
Kentucky? The same state where UPS lost my MESA/Boogie Road Ready 4X12 cabinet. How do they lose such big packages? Very fishy IMO. The bottom case is only 16 inches high. But I do have a case that will fit your combo perfectly, I PM’d you. I prefer the early one, the EV v. C90 is a big deal, IMO. That is excellent tone from the dark side. The JP2C can get very hairy when the shred mode in engaged, but it still falls short of the gain that a C++ has. It's a "Mark II Super C+" according to the badge inside the head shell.